Technical analysis is the only investment methodology I know of that has one hard-and-fast rule: If a market is at point A and it is headed to point C, and B is somewhere in between, then it will have to pass through B on its way to C.
Now, it’s not always as easy as just “buying at B,” but you’ll do much better attempting to trade with the trend somewhere around B than fighting the trend—or worse, trying to interject some sort of fundamentals, valuations, or other reasoning into your trades. On the flip side, if a market makes it to C and then begins to have a round trip back to A, it will have to pass through B on its way back down to A. If a market is to go beyond C, then it will start by approaching C.
Considering this premise, why not stay invested as long as a market stays near C and then exit (or possibly even take a short position) if it begins to fall back to B? Now, before we develop a system, we need to do decide exactly what “near C” is. Although it is somewhat arbitrary, I figure that as long as the market (based on the S&P 500) is within 10% of its 50-week high, then it is healthy and has the chance to go to C and beyond. Conversely, if a market is further than 10% away from its 50-week high, then it could be in trouble, or at the least, it isn’t acting very healthy. To reduce upside whipsaws (premature buys), I added the rule that to go long in a market, the market must not only be near C (less than 10% away from its 50-week high), but it must also have two lows above its 50-week moving average. This is known as upside “daylight.” (See my article for more detail on this concept, which I also call “Davelight.”) This simple rule helps to ensure that the market is trending in the right direction. In other words, I don’t want to wait until the market is already in a serious sell-off. By then it might be too late. In markets, you often want to sell first and ask questions later. The old hedge fund adage “he who fights and runs away, lives to fight another day” comes to mind. Case in point: In 1987, the market dropped below 10% of its 50-week high and closed below the 50-week moving average on the week ending Oct. 16, 1987. There wasn’t downside daylight until the following Monday. By then, the market had already dropped an additional 34%. Note: In the upper chart, readings above or below the blue line show how far the market is from its 50-week high. Readings above the blue line are bearish, indicating the market is more than 10% from its 50-week high. Buy a market when there are two weekly lows above the 50-week moving average and the market is less than 10% away from its 50-week high. 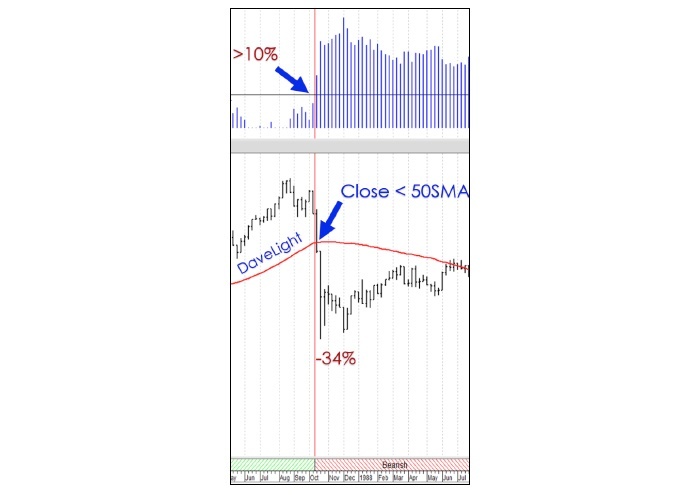 Exit the market when it is greater than 10% away from its 50-week high and it closes below its 50-week moving average. I have resisted the temptation to add additional rules for fear of making a simple system complex, and, more importantly, I wanted to avoid fitting the curve to the data. Now, before we get into the observations, keep in mind that my goal was not to create a strict mechanical system but rather a simple tool to help me to “err on the side of the longer-term trend” and to help me get out of the way during bear markets. This simple system does a good job of keeping you in long-term secular bull markets and keeping you out of bear markets. In the following figure, notice that it stayed bullish (or, at worst, neutral) for nearly a decade during the great bull run of the 1990s. The good news is that this system would have gotten you out of every bear market fairly quickly. If you think about it, if a market is going to lose half of its value or more, it’s going to pass through “B”—losing 10% first. Looking back at the past two bear markets, there were sell signals in October 2000 and January 2008. The market subsequently dropped over 43% and 52%, respectively, before recovering. Notice in Figure 3 that the system stayed bearish (or, at worst, neutral—no buy signals) throughout the last two bear markets and bullish (or, at worst, neutral—no sell signals) during the bull market in between. If you go way back, in 1929 the market dropped over 83% after the exit (Oct. 25, 1929). Obviously, there are no guarantees when it comes to markets, but as you can see, something as simple as this can help to keep you on the right side. The last sell signal was in January 2016 (after staying bullish for the three years prior). This signal turned out to be just a whipsaw, but that’s OK. Sometimes, it’s better to get out of the way and then ask questions later. For now, we remain in an obvious bullish trend. Technical analysis has the word “technical” in it, but it doesn’t have to be mind-numbingly technical. Staying on the right side of the trend is often as easy as ABC. Charts created with MetaStock. Dave Landry’s indicators such as “DaveLight” are available for free with MetaStock at http://www.metastock.com/davidlandry.